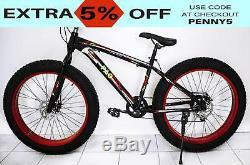 Large Tire Heavy Duty Fat Wheel Mountain Bike (Premium Red & Black Bicycle). Designed with quality and the open road in mind, this heavy duty huge wheel fat tire sleek and sporty bike is sure to deliver a performance ride with eye catching style, a combination that will see you enjoying the great outdoors all year long. 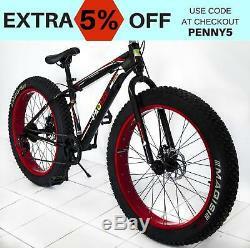 There is no off-season with this fat tire bike. It takes you places youve never biked before! 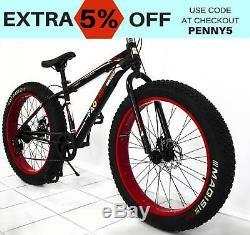 The fat tire bike provides improved grip and traction on the most troublesome terrain. 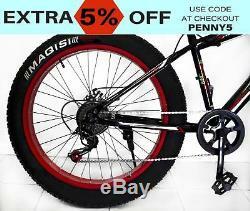 This is a great bike for riders want to ride every trail they can find. 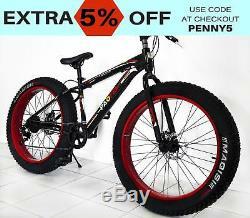 The 26 x 4.0 fat tire mountain bike is built for all round trail riding. It features 26 x 4.0 tires. A push button speed adjustment, a multi-speed drivetrain for a super smooth ride and shifting, as well as extra thick double wall rims for added protection, front and back disc brakes and much more. The Joti Heavy Duty Large Tire Mountain Bike gives you upright confidence, control, and road-to-trail versatility, wherever you ride, and is designed to let you ride on and off the trail in total style and added comfort. 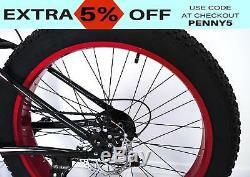 The fat tire bike provides high comfort standards at lower tire pressure. The unique look and features simply make riding fun. Huge wheels: Fat 26 x 4.0 Tyres. Push button lever for 7-speed adjustments. Internet banking and bank cheques offered also. (95% of the time Mon-Fri). We're dedicated to 5-star customer service. Your feedback is very valuable to us. Please do assist us here, and take the short time to send through your feedback. We strive for 100% satisfied loyal customers who are happy to shop with us again & again. If you're like the majority of our customers, you'll be rapt with the products and the service. We respond within 24hrs with courtesy and professionalism. Check out what our happy customers are saying! We'll also notify you when your item is on its way. Please note, we are UNABLE TO DELIVER to the following postcodes. Tip - may we suggest getting the item delivered to a family or friend's address who's postcode can receive the item. NSW - 2831 (Neilrex, Eumungerie, Carinda, Nymagee, Quambone) SA - 5701 (Woolundunga) WA - 6740 (Drysdale River, Mitchell Plateau, Oombulgurri, Kalumburu, Prince Regent River, Wyndham) 6743(Warmun, Cambridge Gulf, Lake Argyle, Durack, Gibb, Kununurra) 6799(Home Island Cocos Island, West Island Cocos Island) TAS - 7151 (Heard Island, Davis, Mawson, Macquarie Island, McDonald Island, Casey). BULKY ITEMS UNABLE TO DELIVER TO. T - 0800 to 0999 NSW - 2641, 2717 QLD - 4421, 4450 to 4499, 4680, 4700 to 4805, 4806 to 4899, 4900 to 4999, 9920 to 9959, 9960 to 9999 S. A - 6055, 6215 to 6699, 6700 to 6799 TAS - 7151. We 100% guarantee that all items will be as described. In the unlikely event that your item is damaged (Dead On Arrival - DOA) or faulty, we ask that you kindly contact our team within 6 days of receiving your item. Please follow the manufacturers instructions at all times. Please do not attempt to return any item until instructed by one of our team. We are an Australian family business so you can have confidence when shopping with us, as we're dedicated to delivering exceptional customer service and sell only quality products. Our warehouse is available in Sydney & Melbourne location. 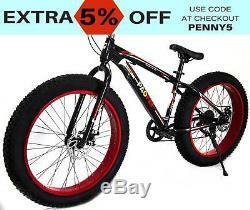 The item "Large Tire Heavy Duty Fat Wheel Mountain Bike (Premium Red & Black Bicycle)" is in sale since Thursday, September 6, 2018. 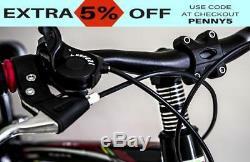 This item is in the category "Sporting Goods\Cycling\Bicycles".au-9" and is located in New South Wales. This item can be shipped worldwide.